Solar Powered Security Lights like Solar Motion lights and other garden lighting solar make you feel safe at home without the utility bill. Many people do not feel safe at home. Especially at night. If you are one of them, do not feel bad. When I was little, often switched on the bed lamp at night, because I was scared. Only to fall asleep with the lights on (doctors will tell you this is far from healthy). Today, I am still wide awake in the middle of the night if there is some noise in the house. If it weren’t for the demands and complications a dog naturally has (well, I would want a big one – hard to get on a plane to the US), I would get one. And especially if you have lots of space around your home, with no familiar people around you, you might feel better installing Solar Powered Security Lights around your home. Depending on what you prefer, you could illuminate your yard (partly) with a combination of Solar lights for the whole night, without paying for electricity. Or you can get yourself Solar Security Lights, especially designed to illuminate an area (ie. your front door), whenever there is movement. To be able to do that, these security lights are equipped with a motion sensor. So any lowlife lurking in the dark will feel exposed instantly this light goes on… and will leg it. Another advantage of this kind of security lights is that the lowlife does not know where these lights are, so they are harder to avoid than constant lights. Again, with this kind of security lights you do not have the problems like digging your garden over, cabling or being awarded the title “customer of the year” from your utility company. If you like my idea of illuminating the unsuspecting lowlife, there is even a Solar Motion Activated Halogen Security Light. The potential villain will stand there “pants down” in travelling light…right in your backyard. I hope he still can at least smile for the camera ;)…in the police department. Again, the potential problems arise from the batteries. I again recommend to you to buy from a trustworthy dealer who is giving you at least a six month (twelve is better) guarantee. My trusted dealer is Kriss Bergethon. He has been where you are right now and built a shop around his needs – I assume it is sometimes dark and lonely in the Colorado mountains. 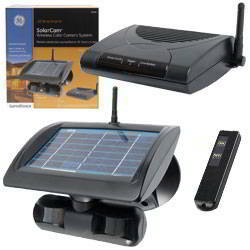 Take a look at his solar security lights assortment.